Does the television audience still want candy? Has the Candy Crush TV show been cancelled or renewed for a second season on CBS? The television vulture is watching all the latest TV cancellation and renewal news, so this page is the place to track the status of Candy Crush season two. Bookmark it, or subscribe for the latest updates. Remember, the television vulture is watching your shows. Are you? Mario Lopez hosts this TV game show on the CBS television network. On Candy Crush, contestants maneuver to match three or more colorful candies to earn points, overcome obstacles, and move up through over 2,000 available levels. Teams of two employ mind and muscle to compete on a large, interactive game boards, powered by next generation technology. Their goal is to conquer the Candy Crush game and claim the champion crown. The first season of Candy Crush averaged a 0.51 rating in the 18-49 demographic and 2.22 million viewers. Find out how Candy Crush stacks up against the other CBS TV shows. 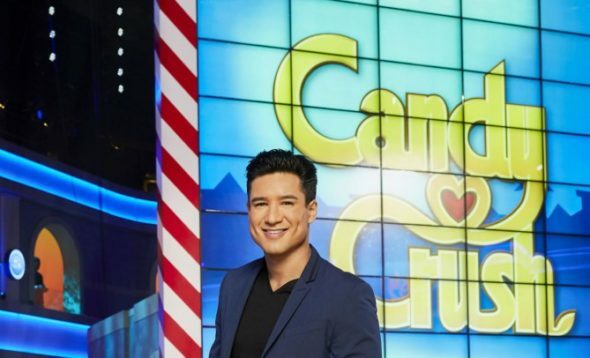 As of April 26, 2019, Candy Crush has not been cancelled or renewed for a second season. Stay tuned for further updates. The ratings for Candy Crush have been dipping very low so I suspect that CBS won’t be bringing it back for a second season. I’ll keep an eye on the ratings to see if things miraculously start to change. Subscribe for free updates on any Candy Crush cancellation and renewal news. Find more Candy Crush TV series news or other CBS TV show news. What do you think? Do you hope the Candy Crush TV show will be renewed for a second season? How would you feel if CBS cancelled this TV game show, instead? More about: Candy Crush, Candy Crush: canceled or renewed?, Candy Crush: ratings, CBS TV shows: canceled or renewed? Man with a Plan: Cancelled or Renewed for Season Three on CBS? I’m keeping my fingers crossed, keeping my hope alive that CANDY CRUSH SAGA GAME SHOW COMES BACK.. WE NEED MORE CANDY, WE NEED MORE CANDY, WE NEED MORE CANDY !! Pleaseeee, l love candy crush an Mario López. Is a amazing show, and family members enjoy the show together. .☆☆☆☆☆. Please keep Candy Crush! This show is so much fun to watch. Maybe a summer start wasn’t best…fall would be awesome because most families are home because kids are in school. It’s great for bringing the family together around the tv like back in the days. I would love to see the Candy Crush game show be renewed for a second season. I am enjoying it very much. I sure hope the show comes back. Mario Lopez is an incredible host. Please don’t cancel the Candy Crush game show….